Last week, we reported on a Miller beer ad on a Summit Media billboard across the street from a church and Head Start pre-school. 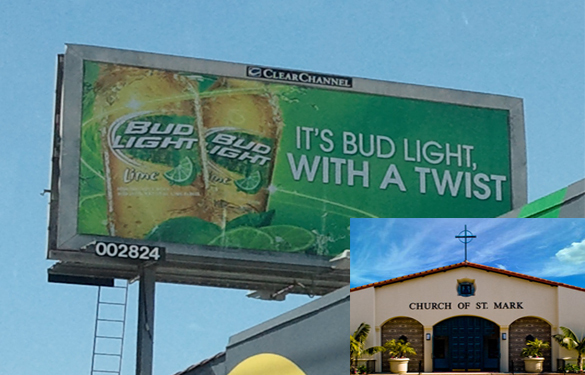 This week, it’s a Bud light ad on a Clear Channel billboard less than 300 ft. from the grounds of a church and elementary school in the same community. In addition to the industry code cited in last week’s article, Clear Channel has its own Code of Advertising Practices that includes the following: Establish exclusionary zones which prohibit advertisements of all products illegal for sale to minors that are intended to be read from or within 500 feet of established places of worship, primary and secondary schools or playgrounds.